Misty Miller, aka "Misty Moonshine"
END of TRAIL, the World Championship of Cowboy Action Shooting, Wild Bunch Action Shooting & SASS Mounted Shooting will celebrate its 35th Anniversary at Founders Ranch, New Mexico, June 16-26, 2016. END of TRAIL 2016 will open with World Championship Wild Bunch Action Shooting. It is a twelve stage match using rules very similar to SASS Cowboy Action Shooting, Wild Bunch Action Shooting employs the use of a 1911 pistol rather than single action revolvers, SASS legal pump shotguns, and lever action rifles. The idea for the equipment and dress used in the sport is based on the 1969 movie “The Wild Bunch”. 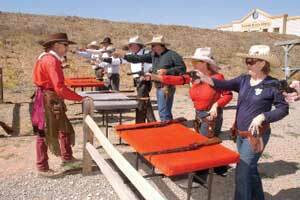 . .
Shooters are required to perform using two six-guns, rifle and shotgun in each of the main match stages. Shooters can expect to fire ten pistol, up to ten rifle and up to six shotgun rounds for each stage and should be prepared to bring enough ammunition for the warm up and main matches. Spectator and guest crowds are welcome at END of TRAIL. Due to the increased potential for accidents, The Wild Bunch, and our liability carrier have all shared concern about uncontrolled access to the immediate vicinity of the shooting. Only registered shooters, match officials, and registered media representatives have access to the range area (that is, inside the bays). This means your family and friends must watch from behind the safety fence. END of TRAIL 2016 will again utilize the coveted ACES Scoring system alongside the matches tried and true methods. A special seminar on ACES for anyone interested will be held onsite. Please check the event schedule for times and location. Anyone who intends to take care of scoring for their posse is strongly encouraged to attend. Each evening our staff of ace scorers have historically beene working diligently to keep up with the competitor scores. In process score sheets will be printed and posted Thursday, Friday and Saturday evenings. We are looking forward to the ACES Program easing the the upload and reporting of scores during END of TRAIL. Please check your scores and make sure they are correct. If your scores appear to be in error, please report the matter to the SASS Admin. The Admin personnel will communicate directly with the scoring staff. Every effort will be made to correct the error as quickly as possible. Any shooter attempting to communicate directly with the scoring staff, either about the scores, or the time of day, is in dire jeopardy of being disqualified from the match. Leave them alone! Our restrictive schedule does not allow time between individual shooters and posses for brass pick-up. END of TRAIL is a lost brass match. The 4H group is onsite to pick up and collect brass. The brass will be sorted, cleaned, and bagged for purchase by the volunteer group for fundraising. Be sure and stop by, buy some brass, and support this great group of volunteer kids that do so much for us! A special warm-up range has been set aside as function fire areas. Also, END of TRAIL is not the place to come and practice, sight in your firearms or hold private side matches. If you need to function fire your firearms to verify safe, reliable operation, approach any range officer supervising an operating range. When there are no lines of waiting shooters, you will be given permission to send a few rounds down range. When registration for END of TRAIL closes, all shooters’ names and numbers are entered into our computerized scoring program. To the extent possible all requested pairings will be accommodated by placing individuals on adjacent posse. Once these posse assignments are completed, the program randomly scrambles the remaining shooters’ numbers and groups them be tens. Presto! We’ll have our computer selected teams. Please notify the END of TRAIL officials of your departure if you withdraw prior to the end of the match. We squad two posses into each shooting slot at each stage. This amounts to approximately 2 minutes for each shooter, beep-to-beep. It is very important everyone make every possible effort to help keep us on schedule. IT IS IMPERATIVE you find your scheduled shooting times on the shooting schedule. You must be at the designated individual and team events by your scheduled times. We recommend writing the times on the Match at a Glance table included in the Shooter's Program. PLEASE CHECK YOUR SHOOTING SCHEDULE CAREFULLY! IMPORTANT: Range officers will not allow any posse to shoot out of squadded order. If you miss your assigned shooting time you will be DNF'd on that stage.